Precision USB Rotary Control with the most strikingly attractive Spinner Tops available anywhere! * Uses Tornado-style Spinner Tops, the best available anywhere. * Can be used as a lightweight Super High Resolution Low-Inertia Trackwheel control as used in "Arkanoid"
* Can also be used as a spinner with the addition of one of two sizes of fly-weight to provide inertia giving long spin-times of up to 20 seconds. * Correctly-designed flywheels with mass concentrated at the larger radius. * Ultra-high resolution. Unbeatable 1200 pulses per revolution. * Super-tough quality. Unit is manufactured by a supplier of encoders for high-speed motor usage and is almost identical to their industrial unit. * Dual sealed ball-bearing races give the ultimate in smooth control. * One-Piece bearing housing/body CNC machined from a solid alloy billet. * USB 2.0 enables a 16-bit interface and a faster packet-rate than USB 1.1 - Vital to avoid slowdown or backspin. * Usage not limited to gaming! Also suitable for precision control applications, CNC interfacing and other rotary measurement applications. 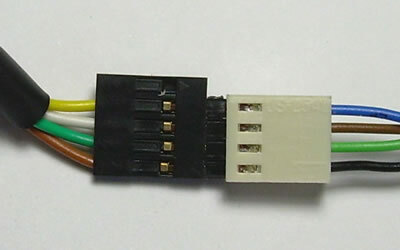 Mouse buttons are connected to 3 pins on the header as shown in the picture above. The COM connection of both switches should be connected to COM and the normally-open connection of each switch to the LEFT or RIGHT pin. It is the perfect spinner for me. Solid metallic construction, smooth working, very accurate,...and very easy to install and to configure. Nice finishing, works well with Mame on Windows, spins silently and freely. I strongly recommend it for compatible games like 1000 Miglia: Great 1000 Miles Rally. I was unsure at first to add a steering wheel to my machine... Best thing I did. Bought the spinner with the steering wheel. Easy to mount, just a 28 mm hole. Set the settings in mame to however you want it, you can change sensitivity etc. Plug it in via usb, if it moves the curser left and right your ready to rock and roll. I bought some normal plastic foot switches off the Internet to work with this and it works fantastic. Had trouble with the spinner at first as no response. Turns out the circuit board was dead. Sent it back to arcade world they replaced it no quibbles, job done. If your playing (mame) - outrun, pole position, chase hq you need this It's awesome! Must have for spinner games! This is simply a must if you like spinner games! Arkanoid, Puzzloop etc just not the same without! Looks great, works great is great nothing else to say about it really. Installs really easy in a 28mm hole and plugs into the USB to be recognised as a mouse basicly. Mounting the Knob can be a little fiddly to get it to run true but is sound once done and spins very freely. If you get the seperate wheel attatchment you could even play some of the basic racing games in Mame! This product is an absolute must for arcade fans, for a long time i resisted buying one but after playing Ikari, 720, arkanoid ect with something that works in this way i could never go back. Ordering was easy, delivery fairly quick to UK can recomend this product and Arcade World UK. Dont delay, buy today! A great spinner provided by and even better company! The spinner is simplicity itself to fit. Just drill a 28mm hole (make sure it is straight to avoid a wobbly spin), insert and plug in via USB. I bought the spinner with the small flyweight and it handles very well indeed and gives excellent results to whichever game you're playing. More impressive though is the customer service and friendly advice from Arcade World; they are simply excellent.